Last December, the lovely Vanessa Dina at Chronicle Books got in touch with me. She asked if I was interested in working on this gem of a project: illustrations for a holiday cookie cookbook with one recipe for each day of the advent calendar. I was two weeks in to having our second daughter. As I remember, at the time, part of me really wondered if I could pull it off while entertaining an antsy three year old, nursing a newborn and prepping for our first Christmas in our home. The other part of me was thinking "don't bat a single tired eyelash, of course you're going to do this." So I did it. And I am so glad that I did! This was an incredibly fun and creative project to work on. Two years ago when I officially launched my business, I did not imagine I'd be working on my first book cover by this point, let alone with Chronicle Books. So, here's a look-see at the process of making these illustrations. Going back through these sketches, I was reminded of a very cozy time in our house. Long days, getting used to being the mama of not one, but two sweet birds; swaddling one girl and playing imaginary games with the other, catching zzz's whenever we had the chance, and feeling really grateful for my family next to our own Christmas tree. 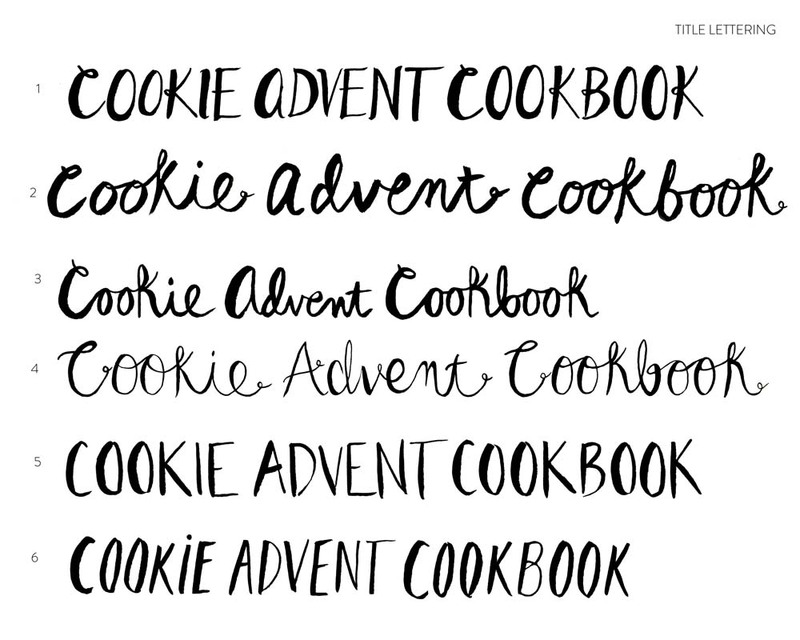 I hope the illustrations in Cookie Advent Cookbook inspire the same feelings in you. You can pick up your own copy at Chronicle Books right HERE. Because the cover of the book would have real paper flaps that would open for each day of the advent calendar, I knew from the start that the illustrations needed to be flexible and easily moved around to accommodate the design. I decided to do the trees and decorations as separate pieces that could all be manipulated later. Here are the first round sketches of trees, trimmings and other patterns. I worked simultaneously on hand-lettering ideas for the page numbers, title, etc. Once we nailed down the general color and direction, I reworked details in the ornaments and trimmings. Some of these got woven into the main tree illustrations, and others became interior patterns and additions to the recipe pages. Then I put it all together! Here are a couple of versions I played with for the cover illustration. In the end we reworked the title lettering and including a painted red banner in the final version. And finally, here are a few shots of the final product! Such a gratifying feeling to flip through the pages of a real book and see my work all throughout! Woot! What a dream.